WaveDaze 2007! October 6-7, Virginia Beach, VA! Thread: WaveDaze 2007! October 6-7, Virginia Beach, VA! The AWA Virginia Beach WaveJunkies are pleased to present the first annual Wavedaze in Virginia Beach, VA October 6 & 7 2007. The combination of a first class community, together with exciting recreational PWC events, will make this a very exciting and memorable event. Wavedaze 2007 is a two-day national personal watercraft (PWC) recreational and family social entertainment event that provides an opportunity to showcase the positive aspects of PWC&#180;s as recreation and a sport. 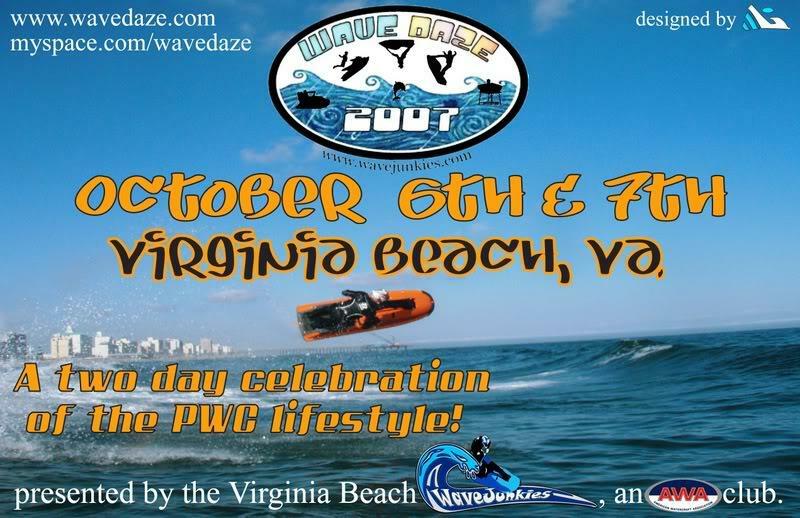 Wavedaze is planned as a charity event with proceeds going to: The Virginia Beach Volunteer Rescue Squad. Funds will be raised through registration fees, corporate sponsors, and raffles. Registration for each personal watercraft is $35 during the event, $25 to early registrants, $25 to AWA members any time. We have a couple events especially for large skis! The "Virginia Beach Coastline Cruise" on Saturday, October 6th and the "Light Tower Challenge" on Sunday, October 7th! Last edited by capitanBS; 08-06-2007 at 11:35 AM. Proud member of the x-h2o.com freeride tour! A Day out on the Chesapeake Bay, Virginia Beach, Va. on the RXT-X 260.